I Am Mike D: A Camper For Mike! For quite awhile I have dreamed of the perfect camper. I have no use for a big fancy motorhome or trailer that can't travel far off the pavement, I want something that can go almost anywhere. Today, while doing some web-surfing I think I found the perfect one. 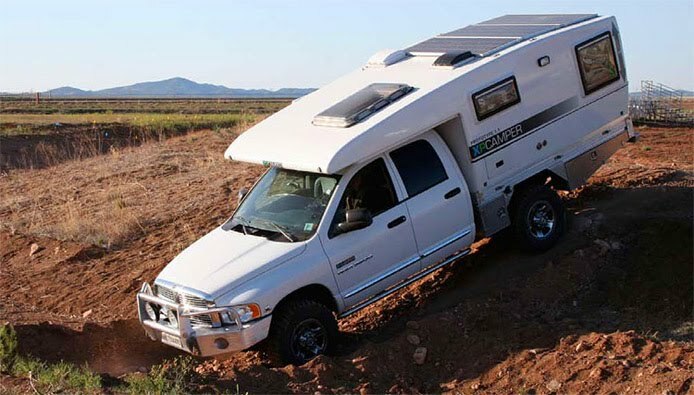 The XP Camper. This here is my perfect camper. A few standout items that make me love it... The diesel appliances, no propane. It looks to be setup to go a long time being self contained with solar panels and 80 gallons of fresh water. It sits on a flat utility bed on the truck, which allows for more room, and more utility when the camper is off. It looks to be made with good marine quality fixtures. The only downfall I see is that it is pretty spendy for a fully outfitted camper, north of $70k w/ a kitted out flatbed installation. That does not include the truck. ...Always a catch. You can save 30k by buying a shell and kitting it out yourself.